Within the pages of Michael Cooley Sr.’s new book, The Power of Forgiveness, ($15.49, paperback, 9781545610510; $7.99, e-book, 9781545610527) readers will find hope and healing for any traumas they have endured. Using his own personal experience as the victim of a terrifying robbery, Cooley emphasizes the role of forgiveness in finally gaining freedom from distress. Michael Cooley Sr. is a devoted husband to his wife and the father of four children. He is an active member of Resurrection Life Church, and he serves as a leader to a men’s ministry each week. Xulon Press, a division of Salem Media Group, is the world’s largest Christian self-publisher, with more than 12,000 titles published to date. 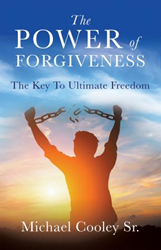 Retailers may order The Power of Forgiveness through Ingram Book Company and/or Spring Arbor Book Distributors. The book is available online through xulonpress.com/bookstore, amazon.com, and barnesandnoble.com.